This study aimed to establish consensus on the expression and distinction of disordered eating in pregnancy to improve awareness across various health professions and inform the development of a pregnancy-specific assessment instrument. A three-round modified Delphi method was used with two independent panels. International clinicians and researchers with extensive knowledge on and/or clinical experience with eating disorders formed the first panel and were recruited using structured selection criteria. Women who identified with a lived experience of disordered eating in pregnancy formed the second panel and were recruited via expressions of interest from study advertising on pregnancy forums and social media platforms. A systematic search of academic and grey literature produced 200 sources which were used to pre-populate the Round I questionnaire. Additional items were included in Round II based on panel feedback in Round I. Consensus was defined as 75% agreement on an item. Of the 102 items presented to the 26 professional panel members and 15 consumer panel members, 75 reached consensus across both panels. Both panels clearly identified signs and symptoms of disordered eating in pregnancy and endorsed a number of clinical features practitioners should consider when delineating disordered eating symptomatically from normative pregnancy experiences. A list of signs and symptoms in consensus was identified. The areas of collective agreement may be used to guide clinicians in clinical practice, aid the development of psychometric tools to detect/assess pregnancy-specific disordered eating, in addition to serving as starting point for the development of a core outcome set to measure disordered eating in pregnancy. Disordered eating has typically been defined as a range of unhealthy eating behaviours and cognitions that negatively impact an individual’s emotional, social, and physical wellbeing [1, 2]. The distinction between disordered eating and a threshold eating disorder (ED) is often the degree of severity and frequency of symptomatology, with disordered eating occurring at a lesser frequency and/or lower level of severity . Much work has been done to understand the symptomatology of disordered eating in a non-pregnant context; however, the presentation and manifestation of disordered eating in pregnancy is less clear. The focus of this Delphi study was to improve clarity around the signs and symptoms of disordered eating in pregnancy, and how these can be differentiated from normative pregnancy-related changes. Such findings may assist in improving the identification of disordered eating in pregnancy. Disordered eating in pregnancy has been linked to numerous negative consequences, such as miscarriage, prematurity, low birth weight, increased need for caesarean section, and other obstetric and postpartum difficulties [3, 4]. Adjusting to the morphological, endocrinological, and psychological changes in pregnancy, combined with the age-related vulnerability of developing disordered eating during a woman’s prime childbearing years [5–8], places pregnancy as a period of increased risk for the onset, resurgence, or exacerbation of disordered eating symptomatology, even for women with no history of such symptoms [9–19]. Over the past two decades, studies have estimated the prevalence of disordered eating in pregnancy is between 0.6 and 27.8% [12, 17, 20–23]. It is plausible, however, that existing rates under- or over- estimate the prevalence of such symptoms due to the clinical overlap between symptoms disordered eating and the experience of pregnancy, and the absence of pregnancy-specific disordered eating psychometric instruments . In addition to representing a persistent pattern of disturbance, disordered eating can also represent changes in eating and exercise patterns due to developmental stages (e.g., pregnancy, early childhood, and advancing age), other mental health conditions (e.g., major depressive disorder), or certain life events (e.g., moving away from home, relationship breakdown). In these circumstances, the changes in an individual’s eating and/or exercise patterns are typically transient and/or not accompanied by significant psychological or physical distress . In relation to pregnancy, most women report disturbances in normal eating patterns , usually in the form of food cravings, increases or decreases in appetite, changes to dietary preferences, inconsistent eating patterns, food aversions, and nausea and vomiting [24, 25]. Despite these behaviours being normal within the context of pregnancy due to hormonal fluctuations, changes in sensory perception, and maternal and/or fetal nutritional needs , many of these pregnancy-appropriate changes overlap with, and could possibly mask, disordered eating symptomatology . For example, ‘eating for two’ could be confused with binge eating, persistent pregnancy sickness could be explained by purging, and changes in dietary preferences and/or reduced appetite could be equated to dietary restriction. A further barrier for identification of disordered eating in pregnancy is introduced when volitional stigma is considered, with research suggesting women experiencing disordered eating in pregnancy are reluctant to disclose their symptoms due to fear of stigma [27–30]. Frontline antenatal practitioners (e.g., midwives/nurses, obstetricians, and general practitioners [GPs]), in addition to other allied health professionals in contact with women during pregnancy (e.g., psychologists, dietitians) may therefore struggle to identify disordered eating in pregnant women, particularly when symptoms fluctuate between alleviation and exacerbation depending on the course and stage of pregnancy . In many instances, clinicians also lack the required training for such identification . The aim of the present Delphi study was to obtain subject matter expert consensus on the expression and distinction of disordered eating in pregnancy to improve awareness and understanding of such symptoms across various health professions (e.g., obstetrics, midwifery/nursing, general practice, psychology, dietetics, exercise physiology, and physiotherapy) and at a community level, in addition to informing the development a pregnancy-specific assessment instrument that may assist in facilitating early identification. The present study used a modified Delphi method [32–34]; a formal methodology used in a range of fields and settings to facilitate consensus discussions among a group of experts when accepted knowledge about a topic/issue/definition is absent or limited . In a broad sense, the Delphi method involves several iterative questionnaires (rounds) to canvass and organise the opinions of an anonymous group of individual experts (panellists). The panel moderator provides structured feedback in between each round to elicit ongoing reflection, usually summaries of the quantitative results and qualitative themes from the previous rounds. This multi-stage procedure continues until a certain level of consensus is reached  or, in more recent years, a ‘stop’ criterion is met . The process used is shown in Fig. 1. Two independent Delphi panels were recruited to ensure diverse opinions could be generated and all perspectives considered. International clinicians and researchers with expertise in the field of disordered eating, particularly in relation to pregnancy and/or women’s health (i.e., professionals) formed one panel. The other panel consisted of women who identified with a lived experience of disordered eating in pregnancy (i.e., consumers). Panel recruitment and data collection was approved by the Bond University Human Research Ethics Committee (#15278) in Australia. Professionals in the current study met one of the following criteria: (a) established interest and expertise in the treatment of disordered eating, preferably within the context of the perinatal period, and/or women’s health; (b) distinguished contribution to the field of EDs as evidenced by (i) Fellowship status by the Academy for Eating Disorders (AED), (ii) Associate Professor or Professor in the field of EDs and/or women’s health, (iii) more than 10 years experience working in the field of EDs and/or women’s health, or (iv) publication of peer-reviewed journal article(s) and/or book(s) focused on EDs/disordered eating and/or women’s health in the perinatal period. Researchers were identified through authorship of relevant articles during a systematic review of literature, and clinicians were identified via online searches, membership of special interest groups, and professional network suggestions. AED Fellows with relevant clinical or research interests, as listed on the AED website, were also contacted. Potential professional panel members were invited to participate in the study via an email that outlined the rationale and purpose of the study, how the results would be used, and the procedure of a Delphi study. It was also noted the study would be carried out in English. Of the 80 emails sent, there was a 44% response rate, which is similar to other published Delphi studies on the topic of EDs [37–39]. Unlike recruitment for the professional panel, it was not possible to employ purposive invitation-based sampling for the consumer panel due to ethical reasons. As such, expression of interest recruitment was utilised, similar to other Delphi studies . This was achieved by posting advertisements on online pregnancy and parenting forums (e.g., BubHub, Raising Children Network, Essential Baby, and Huggies), in addition to targeted advertising on social media platforms (e.g., Facebook, Twitter). Women who identified with an experience of disordered eating in pregnancy, and were interested in participating in the study, were asked to contact the primary researcher and briefly detail their experience. This primarily occurred via email. As one of the main aims of the Delphi process was to clarify the symptomatology of disordered eating in pregnancy, the inclusion criteria for the consumer panel were broad. During the pre-screening process, if a woman described eating-, body image-, or exercise-related behaviours, attitudes, or thoughts that were distressing or caused functional impairment during pregnancy, an invitation to participate was offered. Women who disclosed a medical condition that may have produced such symptoms (e.g., hyperemesis gravidarum) were not invited to participate. Women were invited to participate regardless of symptoms being active or inactive at the time of recruitment. Of the 22 consumers who were invited to participate, there was an 86.4% participation rate. Data were collected across three questionnaire rounds between March and November 2016 using a secure, online survey platform (Qualtrics). Professional and consumer panellists were given four to 5 weeks to complete each questionnaire round, with reminder emails sent twice during each questionnaire completion period. In a systematic review of 100 Delphi studies, Diamond et al. revealed the median threshold for determining consensus was 75% (range: 50 to 97%). As such, consensus in the current study was defined as at least 75% agreement (i.e., ratings of important and very important, or agree and strongly agree) on an individual item. All items were rated at least twice (i.e., in Rounds I and II) prior to the decision to include (≥ 75% agreement), re-rate in Round III (50–74% agreement) or remove (< 50% agreement). Items suggested at the end of Round I were automatically rated in Rounds II and III to obtain two rounds of data. Items were evaluated independently in each panel, and then compared at the end of the study. Consistent with a modified Delphi method, a comprehensive literature search of both academic and grey literature was conducted between October and December 2015 to inform the content of the initial questionnaire. Key search terms were used to locate relevant websites, journal articles, reports, clinical guidelines, books (including diagnostic criteria), booklets, and training manuals. Consistent with Bond et al. , the grey literature search was conducted using Google Australia, Google UK, Google USA, and Google Books, while the academic literature search was performed using PubMed and PsycINFO databases. The key search terms used were: (eating disorders OR disordered eating) in pregnancy; (manage* OR support* OR treat*) (disordered eating OR eating disorders) in pregnancy; (defining OR symptoms of) disordered eating in pregnancy; (screening OR assessment OR identification) of (disordered eating OR eating disorders) in (pregnancy OR antenatal OR perinatal OR maternity care). The first 50 items in each search were retrieved and reviewed for relevance, after duplicate sources were removed [42–44]. To minimise the influence of searching algorithms on Google, as recommended by Bond et al. , several steps were undertaken: (a) the history in Google’s search settings was routinely cleared to minimise the influence of previous searches, (b) care was taken to ensure the primary researcher was not logged into any Google-related accounts (e.g., Gmail) that may utilise demographic details to target searches or information; (c) location features that may bias information presented were disabled and the ‘any country’ function on Google’s searches was de-selected to ensure only local pages in each search region were shown. Sources were included if they were in English, related to EDs/disordered eating specifically in the context of pregnancy, and addressed the key areas under consideration. Pertinent information from each source was categorised thematically according to the areas of investigation in a spreadsheet by the primary researcher. When a search hit generated a website landing page with multiple hyperlinks, all links were reviewed. Overall, 200 sources were used to develop the Round I questionnaire (see Table 1). The primary researcher met with each member of the research team on several occasions to finalise the Round I questionnaire, which resulted in three main sections. Each section included a brief summary of existing literature to contextualise the items that followed. The purpose of these summaries was not to prime panellists in responding, but to present a rationale for why rating of such items was necessary. Throughout the study, panellists were encouraged to draw upon their own experiences when responding to each item. In section one, panellists were asked to indicate the extent to which they agreed that an item reflected a sign or symptom of disordered eating in pregnancy on a 5-point Likert scale (1 = strongly disagree to 5 = strongly agree). A total of 61 symptoms were presented to both panels for rating in Round I. In section two, panellists were asked to indicate how important certain factors were in distinguishing disordered eating from pregnancy-appropriate symptomatology (foci items) on a 5-point Likert scale (1 = not important to 5 = very important). A total of 32 foci items were presented to both panels for rating in Round I. Assessment patterns and methods were assessed in section three; the results of this section are presented in Bannatyne et al. .
To allow rich data to emerge for subsequent questionnaire round development, open-ended questions were included in the Round I questionnaire to facilitate and elicit feedback and suggestions for additional items in each section. Round II and III also included open-ended text boxes; however, use of these was limited to panellists contextualising responses (if required) or providing feedback to the panel moderator if there was difficulty answering a question. Prior to administration, the final version of the Round I questionnaire was piloted on 10 colleagues unconnected to the study (5 academic researchers and 5 clinicians) to ensure adequate face and content validity. Responses from the Round I questionnaire were pooled and analysed in SPSS Version 23 using measures of central tendency (mean and mode), dispersion (standard deviation), and frequency. Panel comments elicited from the open-ended text boxes were downloaded and transferred into a Word processing document and analysed using thematic analysis. Common themes were identified and grouped together, and cross-coded by two independent researchers to ensure accuracy. These comments were then translated into new quantitative items to be included in Round II, provided the ideas had not been included in the Round I questionnaire and were relevant to the scope of the project. It should be noted that although the professional and consumer panel were recruited concurrently, there was a delay in receiving the Round I responses of four consumer panel members due to technology difficulties. To prevent significant attrition from the professional panel, the decision was made to send out the Round II questionnaire for the professional panel, while waiting for the consumer responses to be returned. The outcome of this decision was that Round I item suggestions from the professional panel (8 new symptom items, 1 new foci item) could be incorporated into the Round II questionnaire of both the professional and consumer panel; however, the Round I item suggestions from the consumer panel (20 new symptom items, 1 new foci item) could only be incorporated into the Round II questionnaire of the consumer panel (i.e., the professional panel did not rate new items suggested by the consumer panel). This also meant that items ratings were evaluated independently in each panel. In other words, the two panels operated independently of each other until the end of the study when items that reached consensus in both panels were compared. Administration of the Round II questionnaire was identical in terms of instruction and format to the Round I questionnaire; however, the Round II questionnaire included a summary of the group results from Round I at the beginning of each section. This summary included both central tendency scores for each item and a summary of qualitative feedback. Items that reached the 75% consensus agreement threshold were highlighted for panellists using bolding and asterisks. A similar collation and analysis process was performed on the data from Round II. Administration of the Round III questionnaire followed the same format as the Round II questionnaire. No new symptom or foci items were introduced in Round III; however, panellists were asked to determine the broad frequency at which symptoms might be considered ‘disordered’ in pregnancy. These symptoms were framed as “a significant influence of body weight and shape on self-evaluation in the presence of any compensatory behaviour aiming to prevent/reduce pregnancy-related weight gain AND/OR the presence of binge eating episodes/behaviours that occur and are followed by feelings of guilt or shame”. Frequency response options included once per month, once per fortnight, once per week, and twice per week. Panellists were asked to select one response. The purpose of this question was to identify a broad proxy that may assist clinicians to distinguish disordered eating from normative pregnancy experiences. A total of 32 experts were recruited, with 26 completing all three rounds (81.3% retention rate). Overall, the final sample consisted of 23 women and three men from geographically diverse areas, with an average of 19.08 years (SD = 11.56) respective professional experience and 14.42 years (SD = 10.97) specialisation in the field of EDs/disordered eating. Seven panel members also identified as AED Fellows, a status that recognises distinguished contributions in the area of EDs. See Table 2 for additional panel details. A total of 19 women were recruited, with 15 completing all three rounds (79.0% retention rate). The age of the final sample ranged from 23 to 43 years (M = 45.62 years, SD = 12.08), with the majority of Caucasian ethnicity (86.6%). Of the final sample, five women were pregnant at the time of recruitment (31.2%), one had recently given birth within the past 6 months (6.3%), one had given birth within the past year (6.3%), seven had given birth within the past 2 years (43.8%), and one had given birth within the past 3 years (6.3%). In exploring the pregnancy that disordered eating was experienced in, 10 women (66.7%) reported an experience of disordered eating in only one pregnancy, with 70% noting this was experienced in their first pregnancy (n = 7). Five women (33.3%) reported experiences of disordered eating in multiple pregnancies, including their first pregnancy. For most of the panel, disordered eating was experienced during a planned pregnancy (80.0%). Of the five women who were pregnant during the study, all had given birth previously and all reported experiencing disordered eating in their previous and current pregnancy. Overall, 48 of the 69 potential attributes rated across both panels reached the consensus agreement criterion, including behavioural (22 of 27), physical (3 of 14), cognitive (13 of 16), and affective (10 of 12) symptomatology. An additional 20 items were generated and rated only by the consumer panel, with 19 reaching the consensus threshold. See Table 3 for a list of all the symptom attributes. Both panels endorsed a similar number of behavioural, cognitive, and affective symptom attributes; however, the professional panel endorsed a greater number of physical symptom attributes compared to the consumer panel (10 vs 3, respectively). Cohen’s kappa (κ) was performed to determine endorsement agreement between the two panels. Results differed depending on the symptom category under consideration, with poor agreement on physical symptoms (κ = .165) but very strong agreement on behavioural symptoms (κ = .867). Overall, agreement on all symptoms was modest (κ = .467). Overall, 27 of the 33 indicators rated across both panels to distinguish symptoms of disordered eating from pregnancy-appropriate symptomatology reached the consensus agreement criterion. One additional foci item was generated and rated only by the consumer panel, reaching consensus. Endorsement agreement between the panels was very strong (κ = 1.00). In general, there was agreement across both panels that practitioners could clarify the clinical overlap using a blend of clinical judgment, functional analysis, observation of informational discrepancies, assessment of impact and impairment, and consideration of patient and familial historical factors. The list of foci item ratings can be found in Table 4, while key quantitative and qualitative factors for clinicians to consider are shown in Table 5. • How often is the symptom/s occurring, and with what intensity? • Does the symptom deviate from clinical recommendations during pregnancy (e.g., deficits in dietary intake, excess in exercise behaviours)? • Is the woman’s weight in a healthy range relative to pregnancy stage? Could the symptom negatively impact gestational weight gain? • Is there an actual or anticipated health risk or distress to the mother and/or unborn child? • Does a woman’s family express concern about the symptom/s? • Does the woman have a history of pregnancy complications (e.g., miscarriage, premature labour)? • Is the symptom/s causing physical, psychological, social, and/or relational impairment/difficulty for the woman? • Does the woman have insight into the presence and impact of the symptom/s? • Is the woman open to addressing the concern? • Is there a discrepancy between a woman’s self-reported functioning and the results of medical tests/observations? • Is there a discrepancy between a woman’s report of functioning and partner/family reports of functioning? • Does the woman have a history of mental health conditions, particularly eating disorders/disordered eating? • Is there a history of disordered eating in the woman’s family? In terms of the broad threshold at which behaviours would be considered ‘disordered’, the most commonly endorsed response by the professional panel was weekly frequency, closely followed by fortnightly and monthly frequency. Over half the consumer panel indicated symptoms would only need to occur at least once per month to be considered problematic (see Fig. 2). The present study utilised responses from professionals (clinical experts and experienced ED clinicians and researchers) and consumers (women with lived experience) to identify the signs and symptoms of disordered eating in pregnancy. Overall, the Delphi process allowed consensus to be reached between professionals and consumers on these topics. In clarifying the manifestation of disordered eating in pregnancy, a range of behavioural, physical, cognitive, and affective signs and symptoms were identified. There was a modest level of consistency across the panels (47 symptoms meeting consensus in both panels), and generally a high level of consensus on items (31 with a consensus rate greater than 85% across both panels, 21 with a consensus rate greater than 90% across both panels). Notably, two cognitive and two affective symptoms reached 100% consensus across both panels. Cognitive symptoms were perceived to be particularly concerning by both panels given the affective distress these symptoms can produce for a woman. Such distress may have detrimental and lasting impacts on an unborn child, depending on the timing of cortisol exposure . Differences in panel agreement were, however, evident for a subset of symptom attributes. In particular, the professional panel endorsed a greater number of physical symptom attributes than the consumer panel (10 vs. 3, respectively). This difference likely reflects the medical knowledge and experiences of the professional panel. As such, it may not have been appropriate to ask the consumer panel to rate such items . While many of the endorsed symptoms were consistent with those likely observed in a non-pregnant context, a number of unique pregnancy-specific symptoms were endorsed across both panels including overvaluation of the offspring’s weight and shape (e.g., desire for the baby to be “small” or “petite”), rationalisation of self-induced vomiting as pregnancy-appropriate, and emotional detachment from the pregnancy. Behaviours often normalised outside of pregnancy, such as the use of natural supplements (e.g., tea detoxes) for weight loss, were also considered to be reflective of disordered eating in pregnancy and cause for concern if disclosed to clinicians practicing in this area. Collectively, the findings suggest that practitioners working with pregnant women should be cognisant of two main factors. First, that an absence of physical or behavioural symptomatology alone does not necessarily imply a woman is unaffected by disordered eating concerns during pregnancy. Previous researchers have also suggested that while observable disordered eating behaviours often reduce during pregnancy, high levels of weight and shape concern, which cannot be easily observed and may not be disclosed freely, often persist [12, 21, 47, 48]. Second, that disordered eating in pregnancy reflects a spectrum of behaviours that do not necessarily result in physical weight or shape changes, and that particular exploration of binge eating behaviours and cognitions may be justified. Such notion supports previous work [4, 10, 11, 17]. Together these findings seem reasonable; yet, antenatal practitioners report a lack of knowledge and confidence in identifying disordered eating symptomatology [7, 29]. Furthermore, ED literature suggests that community understanding of the spectrum of disordered eating is poor, with binge eating and/or non-purgatory weight control behaviours often perceived as normative or benign . To assist clinicians working in this area, the signs, symptoms, and delineating factors revealed in this study could be used as a starting point to aid identification. Results of the current study may also encourage and assist in the development of training resources to increase frontline antenatal practitioners’ (e.g., obstetricians, GPs, midwives, and nurses) and other allied health professionals’ (e.g., dietitians, psychologists, exercise physiologists, and physiotherapists) awareness, knowledge, and understanding of the expression and manifestation of disordered eating in pregnancy. Furthermore, emphasising the finding that disordered eating is multifaceted experience is essential, not only for practitioner awareness in potential screening and detection efforts, but also when educating women who may have limited knowledge or insight in relation to disordered eating symptoms. Historically, presentations of disordered eating in pregnancy have often been labelled ‘pregorexia’ in popular media, a term describing an excessive fear of pregnancy-related weight gain and engagement in various compensatory behaviours to avoid weight or shape changes that are characteristic of a healthy pregnancy [50–52]. Given the general population is increasingly reliant on popular media sources to obtain important information regarding their health and wellbeing [53, 54], it is plausible that women experiencing symptoms inconsistent with the explanation of pregorexia may dismiss or downplay their symptoms. Health professionals interacting with pregnant women must be aware of the potential inaccuracies popular media presentations of disordered eating may result in and the need for appropriate psychoeducation to foster awareness and insight. It is also vital that popular media outlets disseminate accurate depictions of disordered eating in pregnancy to the general population to increase awareness and reduce stigma around such symptoms, which may not be visible to a woman’s social support network. Arguably, one of the most challenging aspects of identifying disordered eating in pregnancy is distinguishing clinical features from normative pregnancy experiences . While results of the current study do not entirely clarify this nuanced distinction, there was a strong level of agreement across both panels on various quantitative and qualitative factors (outlined in Table 5) that might assist practitioners evaluate concerning symptoms. Practically, information needed to assess these factors could be gathered in routine history taking, followed by more specific questioning, particularly when symptoms are explicit. When symptoms are more subtle or ambiguous, the professional panel noted implementation of clinical judgment would be required. This may include normative comparison of behaviours to clinical guidelines; evaluation of functional impairment across multiple domains; and assessment of insight/denial via observed behavioural discrepancies. In terms of the frequency at which symptoms may be considered problematic, our findings revealed the consumer panel considered symptoms of relatively low frequency (once per month) to be distressing, compared to professional panel who considered weekly frequency to be concerning. Further research is, however, required to explore/confirm this finding. Although the current study has provided a preliminary expert-derived template for understanding and distinguishing disordered eating from pregnancy-appropriate symptomatology, there are a few limitations worth noting. First, it is acknowledged that the list of symptom attributes and delineating foci generated in the current study is not exhaustive and further discussion in this area is required. Second, as the Delphi methodology does not allow panelists to discuss topics directly with each other, it is possible that rich information often elicited from intellectual discourse with one’s peers may have been missed . This could have been achieved through the implementation of a consultation meeting ; however, the anonymity of the panels likely prevented power-imbalances and group think that may have developed via direct contact [56, 57]. Third, although the professional panel did consist of various professions, it was difficult to recruit certain professionals, namely obstetricians, and male panellists for balanced viewpoint. There are several possible explanations for this. 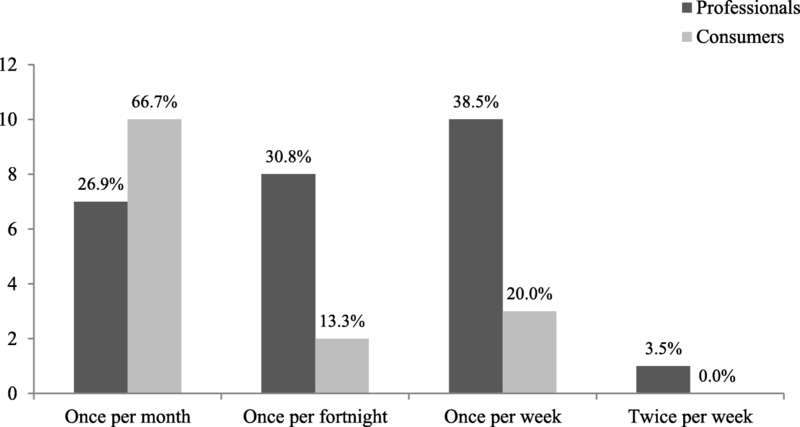 One likely explanation is that the schedules and unpredictable workload of obstetricians have precluded participation in a study over a six-month period; however, flexible completion options were offered to all participants. Possibly, potential panellists from the field of obstetrics may not have identified with the label ‘expert’ due to the limited knowledge of disordered eating in pregnancy. This has been revealed in previous research and may be indicative of a greater educational issue in the field [7, 29]. Future discourse in this area would benefit from a more diverse sample of professionals of both sexes who work directly with disordered eating in an antenatal setting. Limitations of the consumer panel should also be noted. Although the value of recruiting consumers alongside professionals has been emphasised in recent literature , it is possible the broad criteria for selecting consumers may have affected results, particularly given a structured criteria was employed when selecting the professional panel. This may partially explain the modest agreement between the two panels for the overall questionnaire (κ = .529); however, strong agreement was demonstrated on sections that did not rely heavily on technical knowledge, potentially suggesting that some of the discrepancies between panels (e.g., physical symptoms) were more representative of knowledge, rather than attitudinal differences. If ratings for the physical symptoms were removed, there was good agreement between the panels (κ = .672). Future research may wish to develop more specific consumer recruitment criteria based on the findings of this study, while also ensuring all viewpoints are considered. The timing discrepancy in administering the Delphi questionnaire rounds between the two panels was also undesirable, as this meant new items suggested by the consumer panel at the end of Round I could not be incorporated into the Round II questionnaire for the professional panel. Furthermore, this discrepancy precluded the possibility of evaluating items across both panels during the study. As such, the only outcome was to compare the findings of the two independent panels at the end of the study. 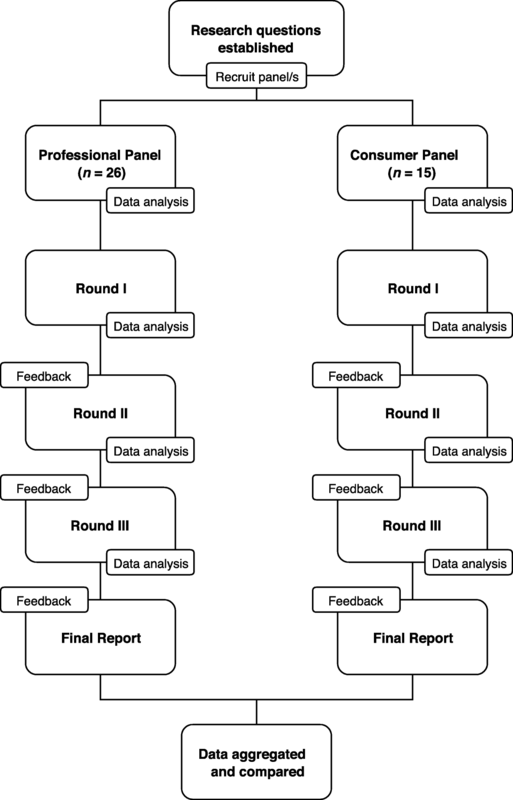 Future research may benefit from combining consumers and professionals into a single panel (provided questions are appropriate and do not rely on specialist knowledge), or at least ensure concurrent administration of both panels to facilitate feedback and item evaluation across both panels during the Delphi process. To conclude, the areas of collective agreement in this study could guide clinicians in identifying and delineating disordered eating from pregnancy-appropriate symptomatology. It is hoped that results of this study will assist the development of psychometric tools to detect/assess pregnancy-specific disordered eating, in addition to serving as starting point for the development of a core outcome set to measure disordered eating in pregnancy . This could encourage a unified research approach when measuring disordered eating symptomatology in the perinatal context and present opportunities for antenatal clinicians to provide appropriate care and support when concerning symptoms are identified. The authors wish to express their sincerest gratitude to all the panel members who generously contributed their time and expertise to this study. The authors gratefully acknowledge the following members of the professional panel, who have consented to be recognised for their contributions: Ms. Jacqueline Byrne, Ms. Amanda Davis, Dr. Justine Ebenreuter, Dr. Melissa Freizinger, Dr. Christine Furber, Dr. Anthea Fursland, Ms. Kelly Gall, Dr. Marcia Herrin, Professor Angelica Lindén Hirschberg, Associate Professor Mimi Israël, Emeritus Professor Michael Levine, Ms. Shelly Read, Associate Professor Elizabeth Rieger, Professor Helen Skouteris, Dr. Stephanie Tierney, Ms. Natalie Watson, Associate Professor Jennifer Wildes, and Associate Professor Stephanie Zerwas. To protect the privacy of the consumer panel members, no individual names have been listed. We are, however, indebted to all the consumers who participated in this study, demonstrating great honesty and courage in sharing their opinions and pregnancy experiences with us. The authors also wish to thank Dr. Elizabeth J Edwards for her support and invaluable feedback during the drafting of this manuscript, in addition to Dr. Pamela Pilkington and Dr. Bassel H. Al Wattar for their helpful feedback during the peer review process. A Research Training Program Scholarship funded by the Australian Government Department of Education and Training supported this research (AB). The items included in the Delphi questionnaires are reflected in the Tables 3 and 4, in addition to Fig. 2. Panel ratings from earlier Delphi rounds (i.e., Round I and II) are available from the corresponding author on reasonable request. AB and RH conceived the study. AB, RH, PS, BW, and KMS contributed to the design and structure of the study. AB coordinated the study, carried out data collection, performed all relevant statistical analyses, and synthesised the findings. RH, PS, BW, and KMS cross-analysed the data. AB drafted and revised the manuscript. RH, PS, and BW provided critical feedback for revision. All authors read and approved the final manuscript. This study was approved by the Bond University Human Research Ethics Committee (#15278). All procedures performed in studies involving human participants were in accordance with the ethical standards of the institutional research committee and with the 1964 Helsinki declaration and its later amendments. Written informed consent was obtained from all individual participants included in the study.